Another birthday rolled by, and this year’s theme was Candy Land. What can be more fun for kids under five, than lots of candy everywhere, lots of games to play, and lots of friends to play these games with? A Candy Land Birthday Party!!! Birthday parties for this age group are fun for the kids, and the adults, since the little ones need to be accompanied by either mom or dad, or both, and everyone gets into a party mood. There was lots of delicious food for the kids, as well as the adults. Chicken Nuggets from Chicken Chalet scored high points with the kids!! Here are some of the pictures I took at the party, in case you are looking for ideas for your next Birthday Party. 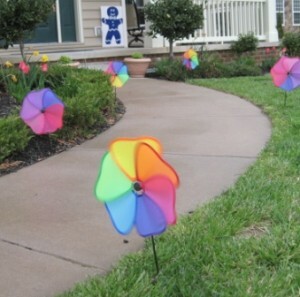 Candy Land outdoor path leading the way to the party. 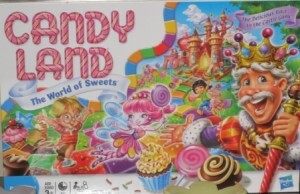 Various colors of these Candy Land characters were strategically displayed all over the house. 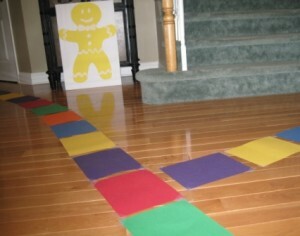 There was an indoor Candy Land path to follow to different activities. In addition to streamers and balloons, there where these extra large “candy” decoration (made out of lantern shades wrapped in cellophane…very creative). 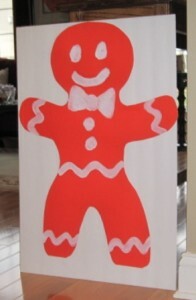 More candy theme decorations, to brighten up the party room. 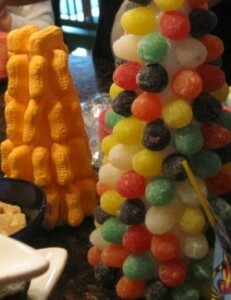 These were made out of styrofoam cones, studded with gum drops, mints, and marshmallow peanuts. Adorable! An awesome assortment of numerous candy choices available to all the party attendees, to fill their take home “Thank You” bags. 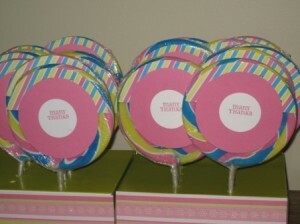 In addition to the above candy bags, everyone went home withe these huge “MANY THANKS” lolly pops. I saved the best for last…. 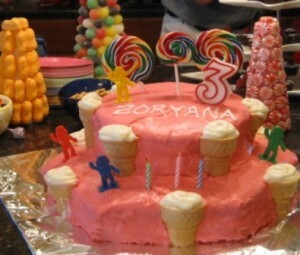 Candy Land Birthday Cake, created by a very hard working, dedicated, and creative mom of the “Birthday Princess”. There were lots of ooohhs and aaahhs, as this cake was displayed. It really turned out very nicely, and it was equally delicious. The kids would of loved it! 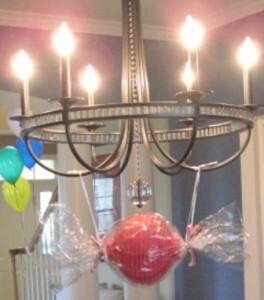 Great idea’s for my daughters bday coming up soon. Thank you. I agree, this game is as much fun for the children as it is for the parents. Monopoly is another fun family game. It was a fun party! I hope your wish comes true, and one of your birthday parties will be in that theme. Thank you for the lovely comments. I attended the party, however all the work was done by the mother of the birthday girl. Yes, she is very creative, and loves crafts. I am sure you will think of a fun party for your daughter as well. I am getting ready for my pre-k calssroom and the theme is A Candyland Of Learning *I bought the lanterns from the Dollar Tree where did you get the cellophane to wrap them?????? Would you please let me know ASAP I will go to the craft store and see if they can help also!!! Love your party!!!!!! My daughter bought the cellophane either at a dollar store or at Jo-Ann fabric, since they have also have a craft section. Good luck with your fun project. Cute! Very colorful thanks for sharing this. 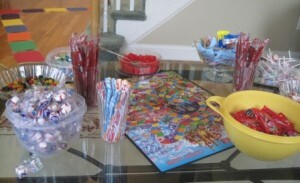 I have a daughter and she’s turning 4 next week and im planning to have a Candy Land Birthday Party Theme. Thanks, keep posting. Your daughter and her friends would love it.